The samples were fabricated as follows. At ﬁrst, a Pt ﬁlm with Cr underlayer was deposited by e-beam evaporation on oxidized silicon wafer using photolithography mask to form contact pads and lanes. Then the wafer was cut up to obtain chips. 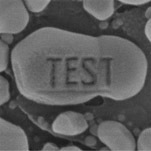 10 nm Al/1 nm Fe bilayer catalyst was selectively deposited by e-beam gun onto the chips using electron beam lithography and a lift-off technique. After that the chips with deposited bilayer catalyst were heated in a furnace in air atmosphere for 2 min in order to form Fe nanoparticles. 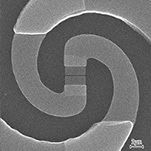 Then the nanotubes were synthesized by single injection of acetylene CVD technique. 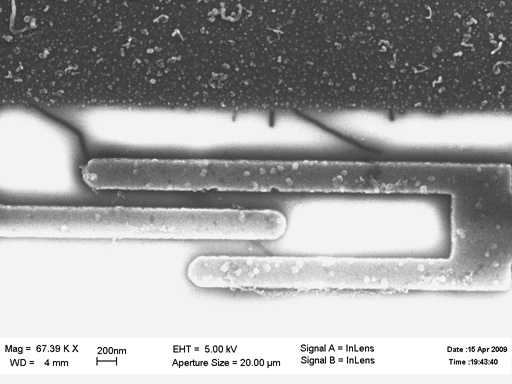 E-beam lithography with NanoMaker system and a lift-off process were used to pattern e-beam evaporation deposited Pd-Al electrodes contacting nanotubes.